We pick up our story of the Columbia SPS Innovation Challenge from Part 1. Without patients, there can be no trials. Yet even for trials of potentially life-saving treatments, participation can be dispiritingly low. According to Team Crypto Clinic, the American Society of Clinical Oncology reports that only 3% of U.S. adults with cancer participate in clinical trials. The core steps to filling chairs with patients — recruitment, retention and site monitoring — account for over 30% of the average clinical trial cost. In a video shared with challenge participants during their work, Peter Thiel recommends focusing on an initial market that a new approach can dominate. Reaching clinical trial audiences is admittedly a niche use case of gamifying marketing with incentives, not even supporting sales, but rather R&D. However, key factors suggest that clinical trial recruiting could be a high-value use case. First, the use case is distinct, with patient networks and support groups adding structure and cohesiveness to the market. Second, the use case has been, and is likely to continue to be, fast growing. Since 2000, the number of clinical trials has grown at nearly 30% annually. As noted by Team Crown, “globalization of clinical trials and the development of new medicines, such as personalized medicine” promise continuing growth catalysts. Improving inclusivity in clinical trials should be another growth driver; for example, in the U.S., although Hispanics make up 16% of the population, they account for only 1% of trial participants. Of course, as one judge observed during deliberations, within a chosen niche, incentive innovators should look for as broad adoption as possible. Challenges in clinical trial recruitment extend from life-threatening conditions affecting large populations to more rare conditions affecting more discrete populations. Self-selection bias probably tilted final presentations toward recommending blockchain and token solutions to the challenge. However, revealingly, when given the option to receive their prizes in familiar fiat (USD) or some form of cryptocurrency (e.g., bitcoin), all participants chose fiat. Even among the more intellectually curious, acceptance of tokens remains a tough sell. A lesson learned is the importance of approaching the problem from the perspective of the users, the patients in particular. 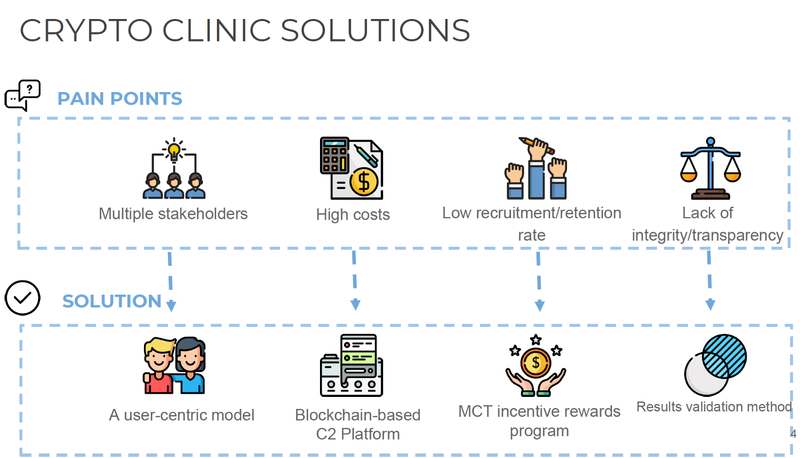 Such an approach highlights the value of focusing on the patient journey, having simple explanations (including of any tokens), and laying out clearly the workflow envisioned by any proposed solution. Why Use A Token? vs. Let’s Use Multiple Tokens! 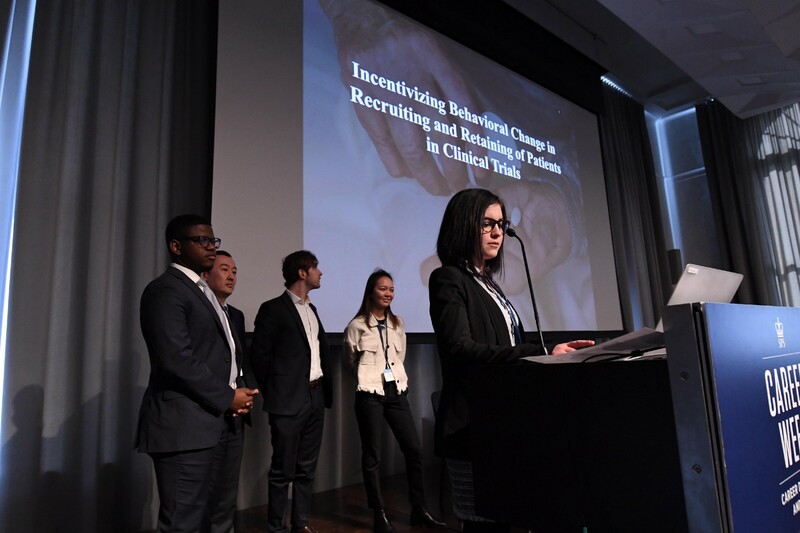 Challenge participants stressed the need to deliver promised value to patients, which led some to consider (if not recommend) fiat incentives, and others to recommend multiple tokens. 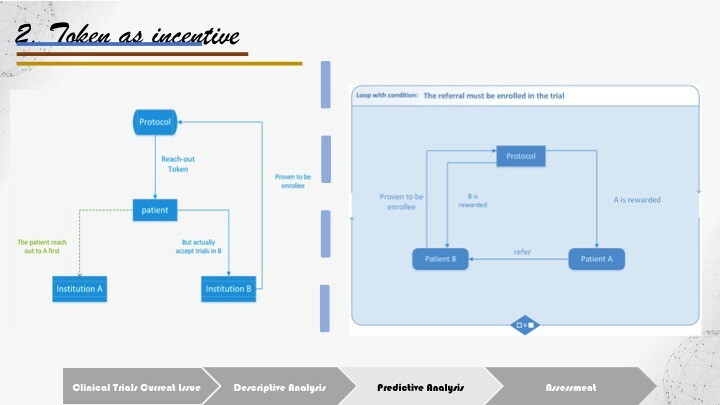 Value stability becomes more important for incentives delivered over a longer period of time, such as for completing behavioral milestones. Multiple tokens, such as one for recruitment and another for retention, allow more flexibility in matching features with user expectations. Regardless of the number of tokens, a number of teams proposed to limit token conversion to fiat. 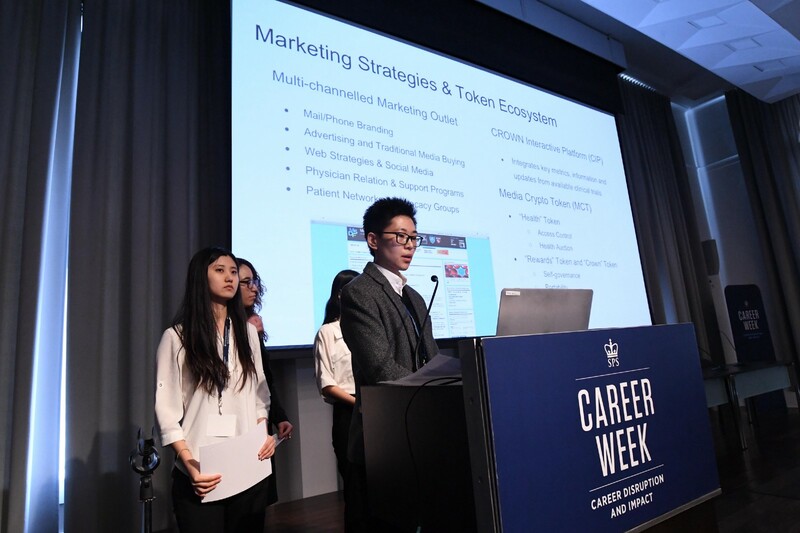 Of course, as came out at the presentations, giving value to such self-contained tokens could require negotiating with vendors to accept the tokens, complicating the go-to-market strategy. There was some focus on exactly what should be required for a participant to be eligible for an incentive, for example, mere enrollment or rather enrollment plus completion of the trial. The conditions should both identify valuable audiences for the recruiters and yet not undermine the value proposition to the prospective enrollees. In a commercial context, conditioning on purchase of a like good or service is one natural approach. In clinical trials, valuable audiences could be defined similarly. The judges noted the teams’ relative lack of attention to go-to-market strategies. Ralph Waldo Emerson is credited with “build a better mousetrap, and the world will beat a path to your door,” but what did he know about marketing? By contrast, Apple’s success is a testament to marketing, with its “1984” ad launching the Macintosh being one of advertising’s most successful. Perhaps use of lottery-style payouts would initially go a long way to attracting a subsegment of the clinical trial patient audience, without busting the budget. The challenge naturally raised issues of how to jump-start use of any new system for trial recruitment and management. Team Newbee proposed adding a referral token to leverage social networks in patient recruitment. There was debate about the importance of referrals as a source of recruits, especially for more serious conditions, where those diagnosed are more likely to actively search for information and options. Less discussed was the potential to use incentives to leverage patients and patient advocacy groups to recruit medical organizations themselves to the practice of using incentivizes in trial outreach and management. Team Crown’s white paper enumerated patient networks, like PatientsLikeMe and Smart Patients, as well as advocacy groups, like the National Multiple Sclerosis Society and the Cystic Fibrosis Foundation. These and other less formal patient networks could potentially be important evangelists of blockchain and incentive solutions. By definition, there are few early adopters of any innovation, including blockchain or its tokens. As described previously, in the fall, the Applied Analytics capstone work isolated an industry’s willingness to adopt new technology as a key factor in assessing whether to recommend application of the MCT for a particular use case. Building on this, Team Crypto Clinic found anecdotes to support clinical trial recruitment as a potential early adopter: Pfizer, Amgen, and Sanofi have announced that they will be focusing on patient recruitment through blockchain to reduce time and costs of their drug development process. IBM and Boehringer Ingelheim just announced a collaboration to apply blockchain to clinical trials in Canada. The teams went light on the regulatory complications, somewhat understandably given the tight time frame of the challenge and the backgrounds of the participants in analytics and management, rather than law. The fact that clinical trial patients do not make purchases per se, unlike consumers in other potential use cases, could actually be a legal advantage. On the other hand, ethical and legal guidelines governing clinical trials may limit the conditions imposed on ultimate incentive delivery. 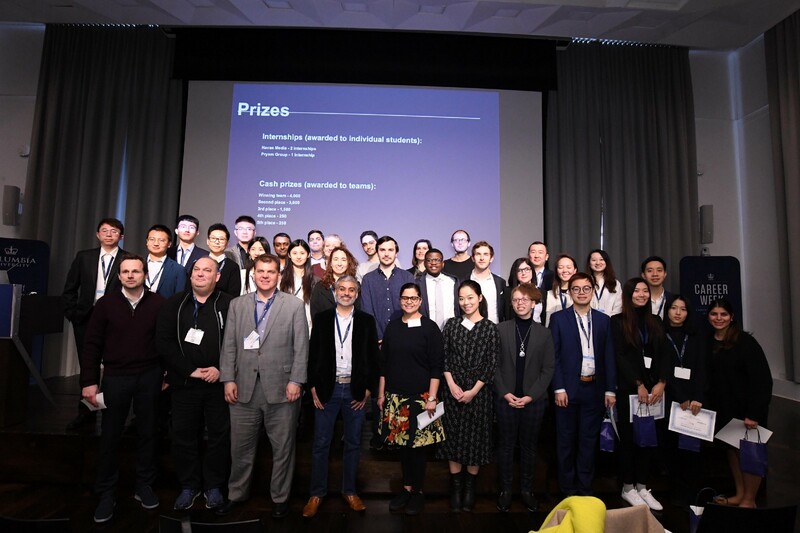 The following teams were awarded prizes: 1st Prize to Team Crown, 2nd Prize to Team E4A, 3rd Prize to Team Crypto Clinic, 4th Prize to Team Newbee, and 5th Prize to Team Shatterbugs. Congratulations to them all! be interdisciplinary, to attract a wider variety of participants. We close with some logistical lessons. Reach out to potential partners and sponsors as early as possible, so that they can have the greatest chance to integrate their involvement (prizes, internships, mentoring, etc.) into their business. Requirements (minimum team sizes, deadlines, etc.) can cure many ills, including the difficulties of bringing participants who’ve never worked together into high-functioning teams in a short time. It helps to provide a channel (e.g., Google Hangouts, Telegram) for participants to ask questions of the organizers and for distributing background material. Assigning mentors can help teams with their work, especially if time is short. When the challenge is over, participants want feedback, and the organizers should be prepared to provide some. Thanks to Alex Cahana and Lou Kerner for their review of and input into this article.